Beautifully diverse cultures, bountiful wild game, breathtaking landscapes, endless public access, it all awaits courageous outdoorsmen and women that aren't limited by imagination or a willingness to travel abroad. 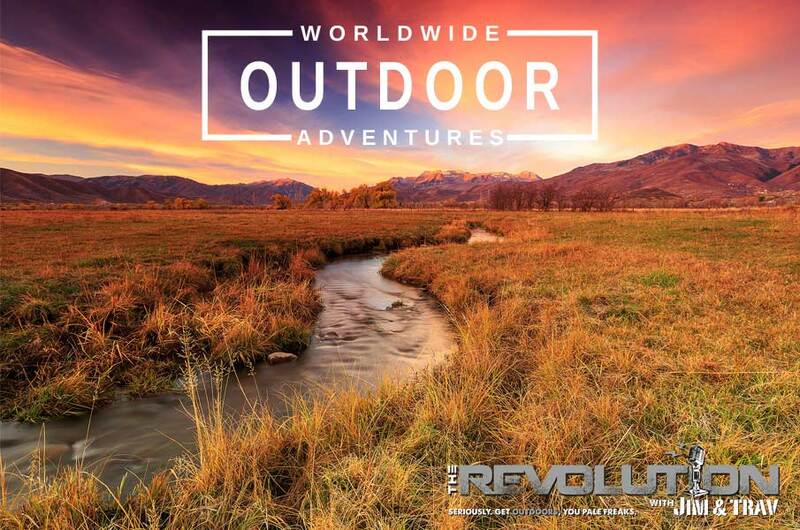 So, this week on; The Revolution with Jim and Trav presented by Outdoor Channel, Sportsman Channel, World Fishing Network and MyOutdoorTV, we'll pursue Worldwide Outdoor Adventures. Dropping by to give an exclusive two-part interview will be will be the intrepid Gregg Ritz of Hunt Masters. Later in the broadcast we'll be joined by the host of Border to Border and Editor of Petersen's Hunting and Wheels Afield Mike Schoby and finally Silencer Shop's Director of Social Media Jeremy Mallette. Navigating the world of international travel can be complicated. As a hunter, when navigating international travel with the addition of guns and gear, things can become even more complex. However, this shouldn’t deter hunters from taking on new adventures abroad. Gregg Ritz is the host of Hunt Masters on Outdoor Channel. Gregg has traveled extensively all over the world, pursuing many different species and documenting it all for viewers to see. Gregg joins Jim and Trav on The Revolution to talk about hunting internationally and more specifically, about a recent trip he took to Turkey to hunt bezoar ibex. Gregg admits there is a certain amount of risk associated with traveling to countries like Turkey; however, he credits Safari Club International, Dallas Safari Club as well as a network of international hunters that have learned to navigate a lot of these locations. Gregg will talk about his hunt for bezoar ibex in the very rugged mountains of Turkey. The bezoar ibex is in the goat family and they prefer living in steep and treacherous terrain. Armed with a 300 win mag, he says that hunters in this country need to be prepared for long shots anywhere between 300 and 500 yards. Ultimately, he was able to make a perfect killing shot at 334 yards and says he is excited to share this incredible hunt with viewers this summer. So, why does Gregg travel to these locations that are often dangerous and unstable? He says his passion to experience other cultures is what keeps him going. In addition, he recognizes the investment that hunters make when they hunt other countries. “Other cultures survive on our economic dollars. Our ability to put those dollars to work for conservation around the world is paramount for some of these species to even survive.” Find out more about his extensive travels in this two-part interview with Gregg Ritz. Silencer Shop is the largest distributor of silencers in the nation. They offer an unparalleled selection with over 190 different silencers to choose from. However, what sets them apart from others in the industry is the technology they use to make the purchase of a silencer as easy as possible for the buyer. Silencer Shop has always handled all the paperwork associated with the purchase for the buyer, but their addition of S.I.D(Secure Identity Documentation) Kiosk goes a step further. Jeremy Mallette of Silencer Shop joins Jim and Trav to explain how SID works. “Currently, silencers are legal in 42 states and we have over 300 Kiosks deployed to these 42 states.” From this Kiosk, buyers can go and enter all of their information and digitally scan their fingerprints. “For the finger prints, once you scan them into our system we keep them on file for you. So, the next time you want to buy a silencer literally all you have to do is go online, pick out your silencer, pay your tax stamp, slide your credit card – and then we do everything else for you. You’re done, you just sit back and wait.” For buyers wary of wading through the red tape and ATF requirements, Silencer Shop has streamlined the purchase process and has done all of the work for you. Jeremy also talks about a brand-new offering they have called the “Single Shot Trust”. When buyers purchase this $25 trust, Silencer Shop will assign the serial number of the silencer to the trust automatically. After approval, the owner of the trust can then add additional trustees. At $25, Jeremy says that the “Single Shot Trust” is the least expensive silencer trust on the market. Find out more about Silencer Shop, their SID Kiosk and no hassle service, tune in! In most circumstances, hunting abroad means hunting with a guide/outfitter that knows the country and wildlife well. Hunting with a reputable guide can increase your chances of success, but also makes your trip a little easier as they handle all of the details for you. Mike Schoby, host of Border to Border on& Sportsman Channel joins Jim and Trav to talk about ditching the guide and doing DIY hunting trips abroad. “New Zealand is the only place, probably in the world, that you can really do a true western do-it-yourself type hunt,” says Mike. In season 3 of Border to Border, now airing on Sportsman Channel, Mike did just that. He talks about renting a vehicle and driving the south side of the island hunting public land along the way and knocking on doors to get permission from land owners to hunt private land. Mike says he believes that New Zealand is probably as close of an experience as you can get to hunting in the states, and maybe even better. With a plethora of big game animals to pursue, generous limits, limited regulations, long seasons, access to public land and the ease of bringing a firearm into the country – New Zealand has a lot to offer hunters. If you don’t have the time or resources to hunt abroad, Mike has this to offer when looking for a DIY public land hunt here in the U.S: “If you’ve never hunted the west and want to do a DIY trip, go on a good antelope trip. Get an antelope tag, success will be 85% or above. You can quarter an antelope up and put it in a cooler and fly home with it. It’s a 3 or 4-day trip to come see the west and hunt on public land.” Catch it all this week on The Revolution.